To Cite: Abbasi M, Dehghani M, Moussavi G, Azhdarpoor A. Degradation of Organic Matter of Municipal Sewage Sludge Using Ultrasound Treatment in Shiraz Wastewater Treatment Plant, Health Scope. 2015 ; 4(1):e23507. doi: 10.17795/jhealthscope-23507. Background: Nowadays, the reduction of sludge production in the activated sludge process as well as disposal restrictions have drawn much attention. Objectives: The purpose of this study was to evaluate the feasibility of using ultrasound treatment in increasing the degradation of organic matter in sewage sludge from Shiraz Municipal Wastewater Treatment Plant and also to assess its effect on sludge dewatering. Materials and Methods: The samples were collected from the anaerobic digester of the Shiraz Wastewater Treatment Plant. The present study was conducted at the bench-scale method. The influence of different pH (3-9) and the effect of contact time (10-120 min) at the constant ultrasonic treatment (37 kHz) on degradation of organic matter were investigated. Since ultrasound is a cyclic sound pressure with a frequency greater than the upper limit of the human hearing range, this limit is approximately 20 kilohertz (20,000 hertz). In addition, the effect of ultrasonic treatment on the total solids (TS), volatile solids (VS), sludge volume index (SVI) and specific resistance to filtration (SRF) were determined. 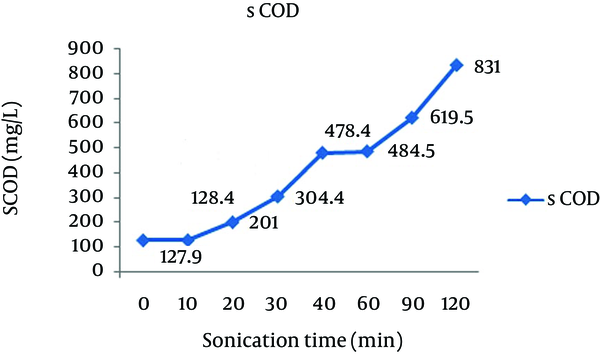 Results: The results of this study showed that the release of soluble chemical oxygen demand (SCOD) in the supernatant and SRF were in the range of 127.9-831 mg/L and 12.48-36.55 m/kg at 10 to 120 min ultrasonic contact time, respectively. In addition, TS and VS decreased from 57.98 and 56.31 to 52.69 and 49.87 mg/L, respectively. Despite the significant reduction in the solids, there was no considerable variation in SVI. Conclusions: This method can be used as a pretreatment method for the treatment of the sewage sludge. Moreover, a complementary treatment is necessary to reach the standard limit. The activated sludge process is used as a biological technology for treating a wide variety of wastewater types. Through this process, a large volume of sludge is generated, as a result of which, the management of the sludge generated by the wastewater treatment is the most costly stage in wastewater treatment (1). Nowadays, all around the world, numerous methods are used to dewater sludge including thermal treatment, Fenton pretreatment, acids and surfactants, electrolysis, and ultrasonic treatment (2). From among these methods, ultrasonic treatment, due to its physical nature, leaves a very limited destructive impact on the environment compared to other methods (3). Furthermore, the ultrasonic technology, as a highly advanced process, is capable of decomposing organic matters. The use of the ultrasonic process in the decomposition of pollutants in water and wastewater is an advanced oxidation process (AOP) and is considered an advanced and efficient technology in various fields of engineering to protect the environment from pollutants and serve as a key method for future generations (4). A large proportion of biological sludge types include microorganisms which have cells, intracellular water, and a membrane (5). Since the main purpose of dewatering sludge is to remove the water trapped in cells, the process used should be able to remove interstitial water (6). When the water solution is exposed to the ultrasonic process, a high pressure gradient is generated in water, which leads to the expansion and contraction of some micron-sized bubbles. This process (cavitation) forms some cavities in the liquid environment. Such cavities can lead to the chemical decomposition of the matter. Moreover, in a liquid environment, radicals H and OH, formed as a result of cavitation, decompose organic matters inside or outside of the bubbles. To overcome the liquid tension to form cavitation-bubbles, a high pressure is required. From the perspective of calculations, the sonic pressure needed to initiate cavitation in water is approximately 1500 atmos 15.2 ×104 KPa, although in practice cavitation can take place under lower pressures (less than 20 atoms 20.3×102 KPa.) too. Definitely, the existence of weak points in the liquid will decrease surface tension. Presently, there is sufficient evidence demonstrating that the existence of gas molecules in the liquid can bring about the weak points. Furthermore, particulates as well as gases trapped in the fissures of such particulates can lower the threshold of cavitation (7). Ultrasonic treatment of sludge will increase soluble oxygen demand in the supernatant of the sludge, simultaneously decreasing the size of sludge solids (8). Ultrasonic waves effectively break sludge flocs, as a result of which, chemical oxygen demand (COD), protein, and nucleic acid are released in the supernatant of the sludge (9).The increase of soluble chemical oxygen demand (SCOD) in the supernatant represents the decomposition if the sludge, through which organic matters are released into water (10). Removing the high amounts of sludge generated is one of the basic requirements of a wastewater treatment plant, covering a huge proportion of costs of running the plant. Thus, proposing proper management strategies for sludge treatment in wastewater treatment plants is very crucial. Because of the problems of sludge dewatering, it is necessary to have an advanced method for sludge treatment to alter sludge structure and involve bacterial cells in releasing intracellular water (11). This study aimed to evaluate the feasibility of using ultrasound treatment in increasing the degradation of organic matter in sewage sludge from Shiraz Municipal Wastewater Treatment Plant and also to assess its effect on sludge dewatering. This study is an experimental study with the main purpose of investigating the effects of ultrasonic waves on biological sludge in Shiraz Wastewater Treatment Plant. The sludge samples were analyzed in a laboratory-scale ultrasonic unit with the Elmasonic S60H model (Germany). This apparatus was operated at a constant operating frequency of 37 kHz. The sludge samples were collected from the anaerobic digestion outlet of Shiraz Wastewater Treatment Plant. Sampling took place in November. 2013. In the current study, the momentary time sampling was done. The samples were collected in the 1-liter polyethylene containers. Then, the samples were transferred to the laboratory and kept at 4°C in a refrigerator in plastic containers until they were used (11). All chemicals were purchased from Merck Company (Germany). In this study, specific resistance to filtration (SRF), soluble chemical oxygen demand (SCOD), total solid (TS), volatile solid (VS), and sludge volume index (SVI) were measured. To measure SRF, the vacuum filtration method was used. Based on this method, 100 ml of the sample was poured into the standard Buchner funnel equipped with filter paper and then the sample was filtered at 75 kilopascal conditions. Finally, by creating a volume/time diagram, the numerical value of SRF was determined (12). Degrees of sludge degradation were determined by measuring SCOD in the supernatant of the sludge, before and after the samples were exposed to ultrasonic treatment (5). Other sludge characteristics, such as TS and VS were determined (12). To measure SVI, the Imhuff funnel was filled up to 1 liter with the well-mixed sample, and it was left to be settled for 45 minutes (12). Before the ultrasonic treatment, the parameters including SRF, SCOD, TS, VS, and SVI were determined for the samples. Many studies have shown that the frequency 37 KHz increased the efficiency of the sludge dewatering (13, 14). Therefore, the effect of sonication at the frequency of 37 KHz on the sludge dewatering was examined for this study. To measure the influence of sonication time at the ultrasonic treatment (37 kHz), different exposure time including 10, 20, 30, 40, 60, 90, and 120 min were examined. Furthermore, to determine the effect of pH, different pH values from 3-9 (interval of 2) with three replications were used. A blank without ultrasonic treatment was also used for all the experiments. Afterwards, the parameters including SRF, SCOD, TS, VS, and SVI were determined on the treated sludge samples. The effect of sonication time of ultrasonic treatment on the degradation of organic matter of sludge was examined. Figures 1, 2, 3 and 4 show the effect of sonication time on SCOD, SRF, TS, and VS of the sludge at constant ultrasound frequency, respectively. According to the results of the current study, the rate of the SCOD in the supernatant of the sludge increased from 127.9 mg/L to 831 mg/L (approximately 4.5 times) as the sonication time increased from 10 to 120 minutes (Figure 1). According to the results illustrated in the current study, at first the SRF value of treated sludge increases very fast as the sonication time increases. After that, the increase of SRF value becomes slow and then increases (Figure 2). Therefore, the extended sonication time led to an increase in the degradation of the sludge. The SCOD values increased in the treated samples. The same trend has been observed for SRF values. 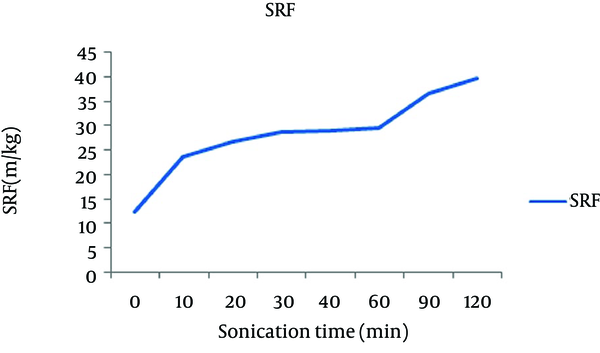 The SRF values were 12.48 to 39.58 m/kg before the sonication and after the 120 min exposure with ultrasonic waves, respectively. Figures 3 and 4 demonstrated that as the time of sonication was increased, the VS and TS values were decreased. The TS values were 58.66 mg/L to 52.69 mg/L before the sonication and after the 120 min exposure with ultrasonic waves, respectively. Similarly, the VS value was reduced from 57.6 mg/L to 49.87 mg/L. Moreover, the rates of reduction for TS and VS values were 10.17 and 13.42%, respectively. 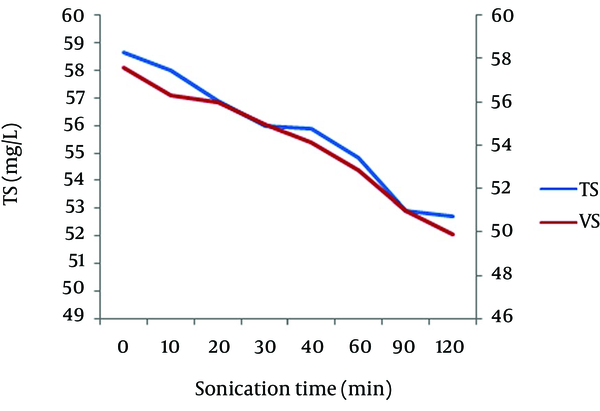 The effect of sonication time on sludge volume index (SVI) of the sludge at constant ultrasound frequency was shown in Figure 4. 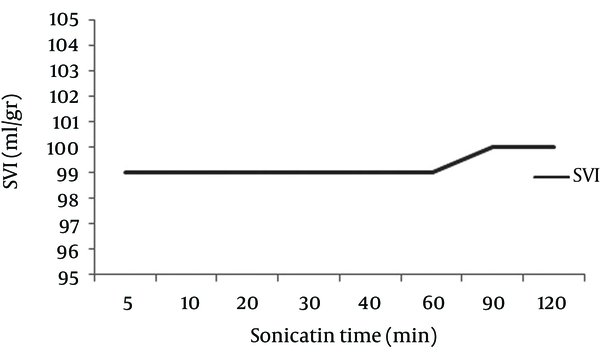 The figure reveals that as the sonication time increases, the SVI was almost constant. The effects of pH on the degradation of sludge were examined at constant sonication time. The variations of pH on the parameters including SRF, SCOD, TS, VS, and SVI were shown on Table 1. Data regarding the effect of pH shows that as pH increased from 3 to 9, the values of SRF, SCOD, TS, and VS were considerably changed. However, the variation of pH did not show a significant effect on SVI. Moreover, the results of this study showed that the pH value of 3 is optimal for the degradation of organic matter in Shiraz municipal sewage sludge using the ultrasound treatment. Therefore, the process of dewatering of the sludge may occur more properly in the acidic pH. aAbbreviations: VS, Volatile Solid; TS, Total Solids; SCOD, Soluble Chemical Oxygen Demand; SVI, Sludge Volume Index; SRF, Specific Resistance to Filtration. The main purpose of this study was to investigate the effect of ultrasonic waves on the degradation of the biological sludge in Shiraz Wastewater Treatment Plant by focusing on the parameters including SRF, SCOD, TS, VS, and SVI. Ultrasonic waves, initiating cavitation in fluids under radiation, cause frictions in them and break them into participles (7). According to the findings, it is clear that ultrasound treatment had the major role in degradation of organic matter in Shiraz municipal sewage sludge. Results of the research showed that by increasing the sonication time, the rate of degradation of organic matter in sludge (SCOD) was increased by 4.5 times (Figure 1). This phenomenon was also reported by many other studies. Zhang et al. also found that SCOD increased from 11.28 to 49.06% during ultrasound treatment (13). An increase in SCOD in the surfactant is due to the fact that, through the ultrasonic process, sludge cells are considerably degraded and this degradation leads to the fracture of sludge flocs into particles and to the release of a large proposition of intracellular matters from the sludge. As a result, a significant amount of the sludge COD turns into a supernatant liquid, increasing SCOD in higher sonication time (13). Our results are in accordance with Tiehm et al. findings (15). Tiehm et al. found that the application of ultrasonic waves at 31 kHz can release organic matter in sludge at 64 second sonication time. Furthermore, they observed that COD could increase the supernatant from 630 mg/L to 2270 mg/L. The sludge digestion period can be reduced from 22 days to 8 days as well (15). According to the results of the current study, the value of SCOD in the supernatant was increased up to 4.5 times at the optimal sonication time at 37 kHz frequency (15). Gronroos et al. showed that an increase in ultrasonic energy caused to break up the sludge flocs and consequently SCOD was increased rapidly through ultrasonic treatment (16). According to Figure 3, the SRF value of the sludge experienced a 68.46% increase as a result of the exposure to ultrasonic waves. This might be due to the facture of sludge cells that leads the generation of particles and disintegration of the sludge at last. This process releases a large proportion of extracellular polymers in the supernatant of the sludge. An over-increase in the extracellular matters destructs the dewatering of sludge, which is reflected as an increase in SRF (17). Zhang et al. also found that an ultrasonic wave for the period of 30 minutes, degraded 30.1% of sludge flocs and the volume of solids was reduced by 23.9% as well. The considerable decrease in volatile organic matters is a good evidence for sludge degradation. The results of Zhang et al. are in accordance with our findings in the present study (13). In conclusion, the results reported the remarkable increase in the SCOD value of the supernatant by the application of ultrasonic treatment. The degradation of organic matter in Shiraz municipal sewage sludge using ultrasound treatment was effectively and rapidly occurred. The findings revealed that the ultrasonic waves decreased the TS and VS values to some extent. The SVI value was changed at a relative slow rate. The optimal condition for degradation of organic matter in the sludge was at pH = 3 and contact time = 120 minutes. However, according to the results of the current study, better dewatering condition of the sludge was not achieved using ultrasonic treatment. Therefore, the dewatering process is expected to encounter with difficulties due to the disintegration of the hybrid texture. The results demonstrated that this method can be used as a pretreatment method for the treatment of the sewage sludge. Moreover, a complementary treatment is necessary to reach the standard limit (16, 17). The authors would like to appreciate the Deputy of Research and Technology of Shiraz University of Medical Sciences for its financial support for the research project of 92-6739. Authors’ Contributions: The overall implementation of this study including design, experiments and data analysis, and manuscript preparation were the results of the corresponding author's efforts. All authors have made extensive contribution into the review and finalization of this manuscript. All authors read and approved the final manuscript.